Dihydrofolate reductase from the deep-sea bacterium Moritella profunda (MpDHFR) has been 13C/15N isotopically labelled and purified. 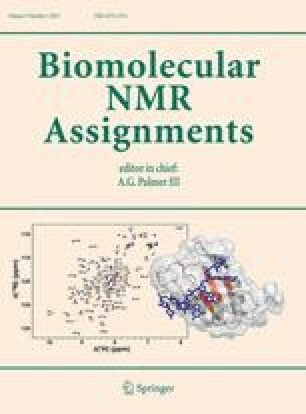 Here, we report the aliphatic 1H, 13C and 15N resonance assignments of MpDHFR in complex with NADP+ and folate. The spectra of MpDHFR suggest considerably greater conformational heterogeneity than is seen in the closely related DHFR from Escherichia coli. The online version of this article (doi: 10.1007/s12104-012-9378-x) contains supplementary material, which is available to authorized users. This work was supported by the UK’s Biotechnology and Biological Sciences Research Council (BBSRC) through grant BB/E008380/1 and Cardiff University. We thank the Wellcome Trust for open access to the Varian INOVA 900 MHz spectrometer at HWB-NMR, University of Birmingham, through Biomedical Resources grant 083796/Z/07/Z. We also thank the Wellcome Trust (WT082352MA) and the Engineering and Physical Sciences Research Council (EPSRC) (EP/F013515) for the Varian VNMRS 600 MHz cryo-probe at the University of Bristol.